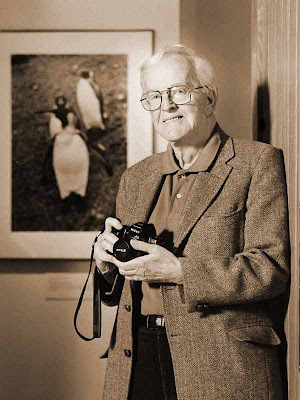 Roger Tory Peterson, artist, photographer, naturalist and inventor of the modern field guide, would have turned 101 today. Roger's first book, A Field Guide to the Birds, was published in 1934 and was an immediate success. His meticulous illustrations of each bird and brief descriptions of its plumage and behavior became known as the Peterson Identification System. He went on to publish a series of Peterson Field Guides which allowed thousands, and eventually millions, of readers to go outdoors and enjoy the beauty of nature. Roger became one of the most celebrated naturalists in the world, winning every possible award for natural science, ornithology and conservation. Birders all over the country think of Roger as a national treasure, but to us, he was an inspiration and friend. He called himself a "student of nature" and taught us to be more watchful and careful in observing the natural world. We were privileged to work with Roger, and his example and encouragement led to the creation of our Peterson Field Guides for Young Naturalists, a series of guides to birds, butterflies and caterpillars. We celebrate our friendship and admiration for a man whose work is fundamental to modern environmental awareness and our understanding of the need for conservation.